The nail like hair is composed of keratin and "dead" except the root. The rate of growth depends upon the length of the distal phalange hence - the index finger is the fastest growing and the little toe the slowest. Rate of growth is between 1-3mm per month, fastest in the summer and in good nutrition. There is so much to our Nail Plate so be sure to choose a product that is safe and healthy. Perfect well groomed nails can enhance the beauty of your hands. We all dream about beautiful nails that are strong, do not chip or break. You can now turn your dreams into reality with the revolutionary Bio Sculpture Nail treatment at Seka’s Case. Bio Sculpture Nails are the leading product in nail care and treatment. Bio Sculpture Gel is a permanent nail colour or clear that lasts for weeks without wearing or chipping. With Bio Sculpture Gel you can create beautiful strong nails with tip extensions, sculpture forms or silk extensions or simply create a gorgeous and strong flexible overlay over the natural nail with colour or permanent French finish. Bio Sculpture is as strong as acrylic however much better and healthy on your natural nail. The Gel moves with your natural nail, it will not crack, the gel is thin yet very strong and will not discolour, does not have that terrible acrylic odour we all hate and most importantly looks natural and will not damage your natural nail structure. Bio Sculpture® Gel is the only gel brand in the world to receive the International 5 Star Farmovs Parexel rating for efficacy and tolerability. Bio Sculpture® Gel does not contain any MMA, parabens, phthalates, toluene or formaldehyde, and as a result of this, Bio Sculpture® Gel is a proud supporter of the National Breast Cancer Foundation. There are no overpowering or toxic odours and little dust as a result of minimal buffing. Face masks don’t need to be worn by Bio Sculpture® Gel technicians. At Seka's Beauty Case @101 Darley Beauty Collective on the Northern Beaches, the top nail salon we offer you the chance to tap into the nail gel that has taken celebrities by storm. Bio Sculpture Gel is a one component nail treatment that strengthens and promotes the growth of natural nails. Once applied, it leaves a glossy finish, makes the nails flexible but strong, and dries instantly under UV light with no odours or fumes. At our Salon in the Northern Beaches, you can discover the healthier alternative in nail treatment that is a pleasure to use and wear. This superior product applied by our professional beauty therapists will enhance your natural nails giving your nails the ability to bend without cracking or splintering. Its secret ingredients offers nails superior impact resistance, wear properties and elastic memory. Bio Sculpture Gel is one of the very few gels that can have nail art embedded into the gel and can then be sealed to protect it, leaving a smooth finish. Bio Sculpture Nail Gel now gives our customers the option to create different nail finishes, flexible, medium or solid nails, depending on the clients’ nail plate, type and lifestyle choices. Bio Sculpture also provides nail extensions and nail repairs with tips or silk extensions. Once applied, Bio Sculpture nails keep their colour and finish for up to 6 weeks. Bio Sculpture Gel actually cares for the nails, allowing it to grow strong and healthy underneath and will repair brittle weak nails. This Nail Gel is chip and smudge proof, and with over 100 fashion colours to choose from, what are you waiting for? Bring your nails back to life and give them a radiant glow! Bio Sculpture Gel Silk Nails are the newest, most natural looking technique in nail extensions and overlays available on the Northern Beaches at Seka's Beauty Case @101 Darley Beauty Collective. Bio Sculpture Silk is weight less and feels so beautiful. The top nail salon in Sydney and top nail salon on the Northern Beaches is now at your doorstep.....You no longer need ugly thick acrylic nails, no excuse NOW. Developed in European nail salons, silk nails offer several distinct advantages. The silk nails are lightweight, and are attached to your natural nail with Bio Sculpture Gel, no harsh adhesives are used. The bond is durable and watertight. This technique eliminates the opportunity for fungal infections which can endanger the health of your nails. Silk nails can also be used to enhance and strengthen your own nails by applying a nail wrap (overlay) to your natural nail. Both extensions and nail wraps will give you a transparent and very natural look. It’s also a great alternative to those who are allergic or sensitive to the chemicals used in acrylic nail extensions, we can create any nail extension with silk from Permanent French, Gel Colour and Nail Art. The care of silk nails is minimal. Manicuring, polish changes or hand creams will not harm your silk extensions. A lot of clients I have met have told me they have had really bad experiences with other types of nail extensions in the past and how it has damaged their natural nail. Please do not let past experiences discourage you. With our experience at Seka's Beauty Case @101 Darley Beauty Collective in Newport and the Bio Sculpture silk nail system your time in the salon will be enjoyable and your nails will look fabulous. Imagine a nail gel so good for your nails it actually nurtures the nail bed allowing the nail to grow. Imagine a nail gel so durable that it doesn’t chip, split or damage your nail. Imagine a nail gel so healthy it protects and strengthens the natural nail instead of causing harsh and sometimes irreparable damage. Bio Sculpture Gel is the top selling Colour Gel that has been clinically tested it has a 5 Star safety rating for the UV lamps there are no fumes, no odours and quick and easy to apply. The Gel dries instantly its strong, durable and flexible. There is no chipping and no nail damage and it assists with Natural Nail Growth, its the healthier alternative to beautiful nails when you need assist with growing your nails and keeping them strong and healthy. Bio Sculpture Gel is truly an amazing product and your nails will look and feel amazing, SAY GOODBYE to thick, ugly, painful and concrete like yellowing acrylic nails and say a big HELLO to thin, gorgeous, pain fee, flexible, shiny, clear healthy nails. At our Bio Sculpture nail salon we can create the most beautiful nails whether it be just an overlay on your natural nails in colour or permanent french or tip extensions to create beautiful long nails and then finish them off with your choice of permanent nail colour or permanent french nail colour. Bio Sculpture® Gel is the only gel brand in the world to receive the International 5 Star Farmovs Parexel rating for efficacy and tolerability. Bio Sculpture® Gel does not contain any MMA, parabens, phthalates, toluene or formaldehyde, as a result of this, Bio Sculpture® Gel is a proud supporter of the National Breast Cancer Foundation. There are no overpowering or toxic odours and little dust as a result of minimal buffing, hence no face masks are worn by Bio Sculpture® Gel technicians. What is the difference in application between Bio Sculpture® Gel and acrylics? Bio Sculpture® Gel is applied straight out of a sterile pot eliminating the need to mix powders with liquids in the salon, making it a far simpler and more hygienic process. As Bio Sculpture® Gel doesn’t set until it is cured under a UV light, it’s easier to work with and to achieve a perfect gel application. Does Bio Sculpture® Gel damage your nail plate? Application of Bio Sculpture® Gel does not damage the natural nail at all as there is no need for roughing or dehydrating the nail plate. The Bio Sculpture® Gel mantra is “Healthier Nail Care” and the ingredients in the gel serve to enhance the condition of the natural nail, proving to be a helping hand to nail biters, who usually find significant growth and the return of nails which they can be proud of. Well thanks to Bio Sculpture Gel and Seka's Beauty Case @101 Darley Beauty Collective, nail salon on the northern beaches. All of your nail dreams are about to come true. Tap into the nail gel that has taken celebrities like JLo, Danni Minogue and Victoria Beckham and the US, Asia and the UK by storm. The new nail sensation is a totally unique product set to give Australian women a nail experience like no other. From the preparation stage right through to the removal procedure Bio Sculpture Gel is an organic healthy alternative to creating beautiful nails. Book an appointment at our Beauty Nail salon to treat your nails with this amazing product. • There is no abrasive preparation no priming or dehydration and very minimal buffing. • It dries instantly and keeps its colour and shine for up to 6 weeks after applying. • Bio Sculpture Gel can be used as a nail extension or simply as a protective coat over the nail. • Bio Sculpture Gel is flexible which makes it durable preventing shattering. • Bio Sculpture Gel is chip and smudge proof. 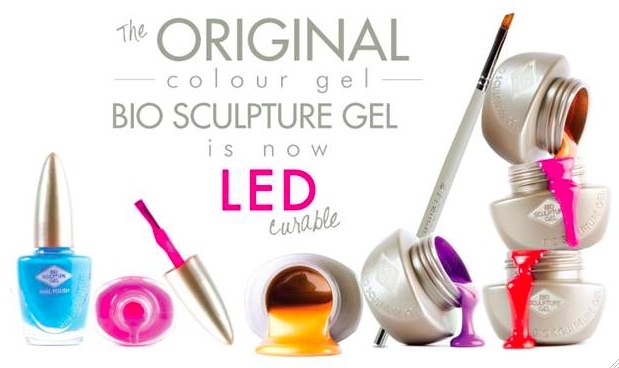 • Bio Sculpture Gel comes in over 100 different fashion colours the choices are endless. • Bio Sculpture Gel can also be applied to the toe nails providing you with the perfect pedicure and because it dries instantly you can slip your feet back into your stiletto with the confidence. Removing the nail is just as easy and damage free as the application. Simply soak in a water based solution and seconds later the nails melt away revealing strong healthy nails. Say goodbye to paper thin weak nails, Bio Sculpture Gel actually cares for the nail allowing the nail to grow strong and healthy underneath. Bio Sculpture Gel also offers an extensive range of products for manicure and pedicures as well as a home kit. Bio Sculpture was founded in South Africa by Elmien Scholtz in 1988. The Brand has expanded into over 25 Countries and the demand for the Brand continues to soar. Recently Bio Sculpture Gel was launched into the sophisticated Japanese market and has exceeded all expectations – this is a huge indictment for the quality of the Brand in such a consumer aware and quality conscious market. The proprietary Branded products are manufactured in house and R&D is a very significant factor and commitment in the Company. Education and training are of the utmost importance and before the Nail Professional can purchase any of the Products, they have to commit to do the Bio Sculpture Gel Training programme to ensure that the Brand is professionally applied and to meet the expectations of the consumer. The Brand also has an extensive range of retail consumer products that are available through the Professional Nail, Spa and Beauty Salon networks. “Ever since I was a little girl I disliked plastic-looking nails. I imagined that there had to be a better way that ladies with short nails could achieve beautiful-looking nails. During my studies I realised that the nails section of the beauty industry was still under-developed. Hair could be semi-permanently waved, lengthened and coloured, yet nail polish colour still chipped from natural nails and lengthened nails looked false. If I wanted a change, I would have to do it myself. So I worked in laboratories with chemists leading them to what I had in mind – Bio Sculpture Gel was the result.” Elmien Scholtz, Bio Sculpture International. Channel 7’s Today Tonight provides critical advice to the clients of nail salons, to help educate them on using technicians who don’t use unsafe or illegal chemicals or tools, have reasonable standards of hygiene and who’s staff are properly trained.